With Venus and Jupiter coming together today in the last degrees of Leo, it’s a good time to work on shedding your inhibitions and taking the world by storm. The Venus / Jupiter conjunction increases confidence, passion and vitality. It emphasizes action and adventure. 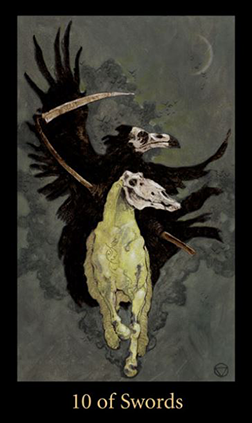 It speaks of seizing the day and going after your dreams like the Princess of Wands (the Thoth Tarot’s version of the Page of Wands) in this card. The Princess of Wands is passionate, confident and adventurous. She’s not afraid to put herself out there and show the rest of the world what she’s made of. She’s enthusiastic and eager to make things happen. It’s a great time for brainstorming, inventing and creating — and not so great for launching a project that is not yet fully formed. As with all of the Court cards, this may be someone in your life or it may relate to qualities that are going to be important for you to embrace. If it’s someone in your life — such as a headstrong and rebellious teenager or a temperamental partner — you’ll have to rise up and meet them on their own turf in order to balance out that energy. The Princess of Wands can motivate and inspire you in your own life too. Ask yourself in what areas have you been too timid or uncertain, and how might incorporating some of her passion and bravery into your own life work to your advantage? The Sun and Mars come together in Gemini today, and may see you feeling the need to think and act more quickly. This aspect is good for clearing the air and for getting on with things rather than dwelling on issues that have been holding you back. It’s good for cutting through confusion and uncertainty and just “doing it” rather than perseveration on whatever’s been standing in your way. And it’s a good time to “wing it,”especially if you’ve been caught up in details rather than looking at the big picture. If you have something to say, now is the time to say it — as long as you temper your words with kindness and diplomacy. 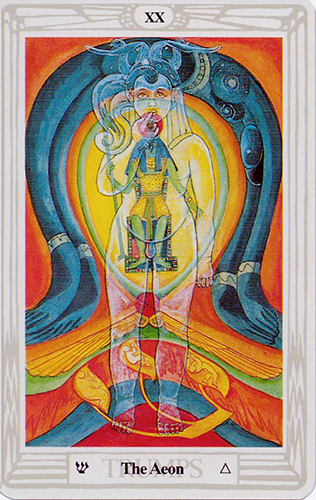 This transit (as well as this card — from Aleister Crowley’s Thoth Tarot) can be impatient, forceful and aggressive. The Knight of Swords wants to hit the ground running. 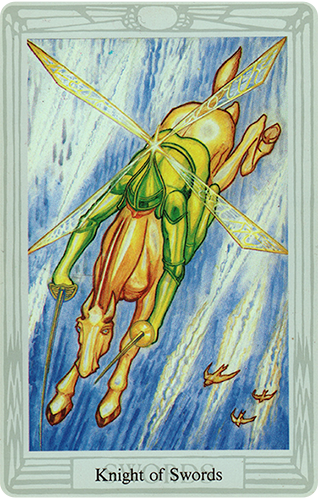 Or hit the air flying as is depicted in this card. It’s all about being on the go, getting things done, cutting through the BS, and shooting first and asking questions later. This Knight is a trailblazer. He slices through the air with his dual (Gemini) swords and moves so fast that he doesn’t even need the propellers that are supposed to keep him aloft. He’s faster than a speeding bullet, faster than the gulls flying behind him. Notice that he’s steering his horse down (toward the earth). He’s not just going somewhere, he’s coming from somewhere too. This is not the day to be lollygagging around. And it’s not the day to be wishy-washy about your goals. It’s a day for action and energy. Motivation. Movement. Direction. Decisiveness. Take a page from this Knight’s book today and get yourself moving, as you have places to go and people to see. Love and romance are in the air today — hopefully for you — courtesy of the Thoth deck’s version of the Two of Cups. 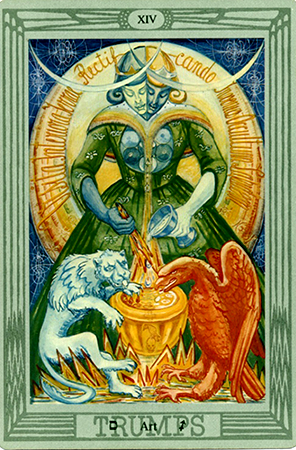 In this version of the card, the astrological glyphs for Venus and Cancer feature prominently. And while Venus is currently in Pisces, the Piscean aspect is referenced here too. The entwined fishes (symbol for Pisces) double as a set of living fountains that refill and replenish the lotus blossoms in an ongoing state of renewal. Notice how the water that cycles between the fountains and lotus blossoms is diverted into two overflowing Cups. It’s a reminder that there is always more than enough — of feelings, emotions, affection, adoration and love. Venus is exalted in Pisces, meaning that its influence in this sign is purer and more refined. It’s in aspect with Pluto today as well — bringing in harmonious (sextile) elements of passion and desire. 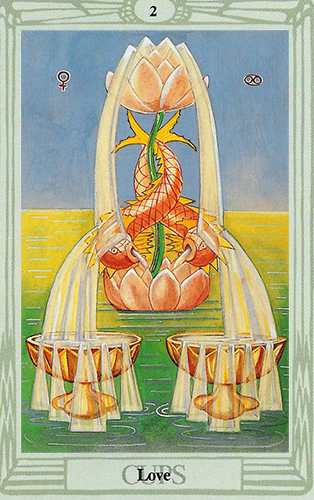 But the Two of Cups is not always a “love” connection. it can refer to a sisterhood, a business partnership, a parent/child relationship or some other deep bond. It refers to the “sum of the parts being greater than the whole” axiom, which reminds us that two heads (and hearts) are better than one. You may meet someone new today or hear from a loved one across the miles. If so, see it as an opportunity for growth. It could be the yin to your yang — or it could just be a friend who shows you the true meaning of the word. Whichever it is, be grateful for the opportunity to express yourself and to spread the love around. Today you may want to pause and reflect on how far you’ve come, as well as where you want to go in the next chapter in your life. 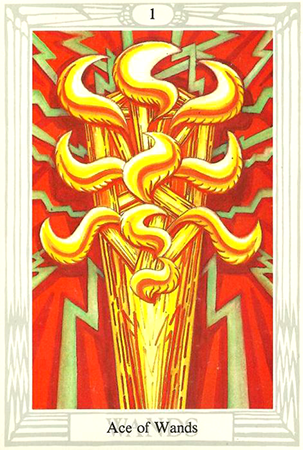 The Four of Wands represents the stage in a project (or relationship, decision, goal, etc.) where you feel satisfied with progress made and are now in the process of gathering momentum. 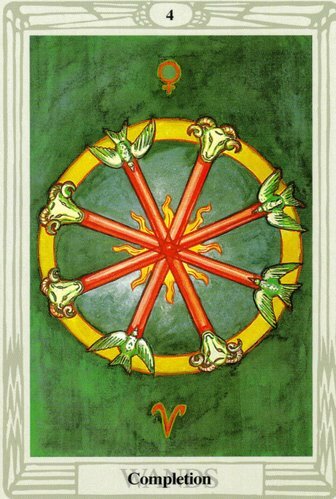 In this version of the card, we see a gold ring with four wands crossing one another from the center and emanating outwardly like spokes on a wheel. Flames radiate in the center and the wands have alternating rams and doves at their tips. 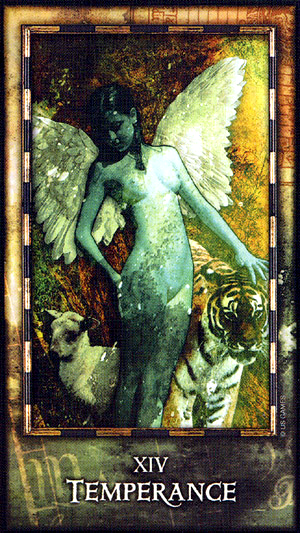 This card is called “Completion” in this deck and is ruled by Venus in Aries — which is where Venus will be later today. Although Venus is said to be in detriment in Aries (as the sign opposing its ruling sign Libra), there are many positive attributes to this archetype, most notably the dynamic Aries impulse to keep things moving. This is a good day to work on being centered and maintaining your composure in the midst of whatever life throws your way. With an intense astrological aspect — a Cardinal Grand Cross — involving four powerful planets (Pluto, Uranus, Jupiter and Mars) becoming as exact today as it’s ever going to get, you may feel like you’re in the eye of a hurricane and when you think about it, that may be the best place to be. A Grand Cross involves four or more planets that are all forming squares (90°) and oppositions (180°) to one another. As squares represent conflict and oppositions represent tension, these aspects can be incredibly frustrating and difficult to contain. 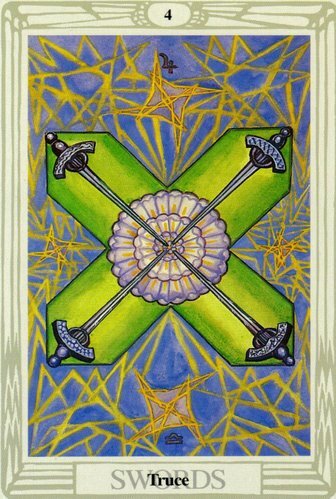 The Four of Swords — called “Truce” in the Thoth deck, and represents a need to bring those opposing forces into the center where they can be focused into one powerful dynamic. While you may feel pulled in several different directions today, you’d be best served to stay calm and carry on, rather than let yourself fall out of balance. The Four of Swords encourages you to ponder, reflect and meditate rather than “act.” It speaks of detaching from the whirlwind of activity around you and to observe rather than participate. Today is a good day to set aside your fears and inhibitions, and embrace the many blessings that the Universe has to offer you. 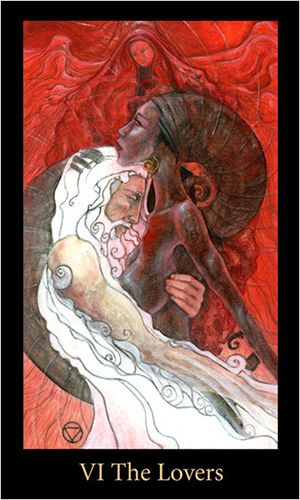 The Lust card replaces the “Strength” card in traditional tarot. The main difference is the emphasis on embracing passion and desire rather than attempting to contain it. 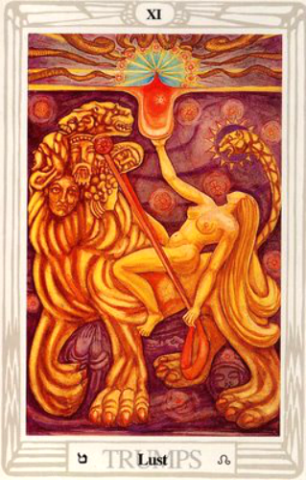 It is a card of joy, exuberance and passion — ruled by Leo (which is where the Moon is today and tomorrow) in its most unrestrained form. In this version of the card we see a woman reclining on the back of a beast with seven heads. These are the heads of a poet, an angel, a saint, an adulterous woman, a man of valor, a satyr and a lion-serpent. She holds the beast’s reins in one hand, and lifts up the Holy Grail in the other. The ten circles in the background are the unordered Sephiroth, which have yet to coalesce into the Tree of Life. Legend has it that the woman and beast are united in marriage. She is drunk with ecstasy, and he is aflame with passion and desire. 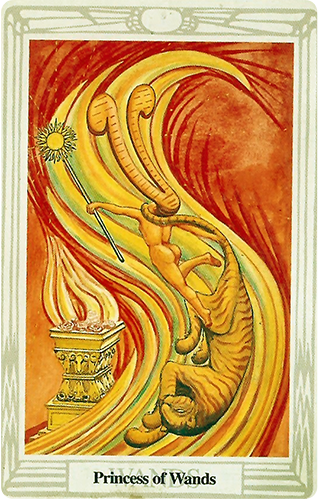 The Lust card is associated with Leo, and is said to be the most powerful of the twelve zodiac trumps, as it is ruled by the Sun. It is associated with the Kerub of Fire — the Winged Lion guardian of the Temple. If you’ve ever found yourself in the uncomfortable position of being torn between two lovers, you’ll know exactly how difficult it is to make a choice. You may have looked at others in that situation with disdain — only to find yourself later on in the exact same predicament. You may have been on the painful receiving end of your loved one being tempted by another, or — even more painful — having given in to those temptations. The lovers card, for all its exciting-sounding prospects, is a card of difficult (and sometimes next to impossible) choices. It doesn’t generally refer to the kind of passionate love affairs that you read about in romance novels. No. Someone usually gets hurt. Sometimes that someone is you. This card refers to choices that must be considered, sacrifices that must be made, and consequences that must be accepted. It can also refer to the union of polarities, as in the Mary-el version of the card. The figures here are about as opposite as they can get: male and female, young and old, black and white. The female figure is strong and aloof, the male passive and vulnerable, Yet they flow together in an intimate embrace. Even so, there’s an apparent emotional disconnect in this rendition. The female figure stares off into the distance while the males gazes downward. So many of us struggle with finding balance in our lives, whether it’s between head and heart, career and family, or material vs. spiritual progress, etc. In the Archeon Tarot, we see an angelic figure: youthful, graceful and innocent. She stands watch over two totem animals, a lamb and a tiger. She appears to be tending equally to both of her charges. The lamb represents peace, harmony and gentility. The tiger represents passion, strength and a wild ferocity. Her manner of tending them is different for each. She keeps a cautious hand above the tiger at all times while watching over the docile lamb. She maintains her sense of balance and equilibrium, all the while staying present in the moment. Ask yourself in what ways taming the inner beast and activating the inner lamb can most benefit you now? You’ll have the opportunity to re-invent yourself this month and to achieve equilibrium in your relationships. You can turn something negative into something positive by striving for balance, harmony and composure. This is a powerful card. It relates to the alchemical process of turning lead into gold. You can activate this concept personally by embracing that which has been resisted or denied and working to transform it. This card is called “Art” (Temperance, in some decks). It speaks of seeking out symmetry. It speaks of finding a middle-ground. In what areas of your life are you too inflexible, too rigid and too unwilling to hear another’s point of view? Your challenge will be to overcome those impediments and to integrate the opposing forces in your life.